Don't eat giant-rhubarb, rather marvel at it's massive size. 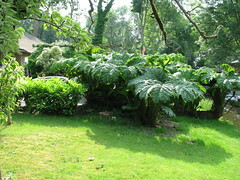 Generous space is needed for this beneficial giant-brazilian-rhubarb look-alike plant. Know how many plants are thought of as rhubarb but they aren't rhubarb at all? There are a few of them. They look like rhubarb because of the familiar shapes of the leaves, the stem is somewhat similar, but these plants are NOT rhubarb. 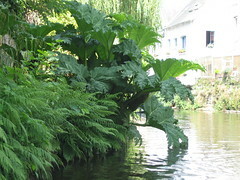 And if you are unsure about any plant that looks like a rhubarb type, don't chance it at all. Giant-rhubarb, as they are referred to, mean certain things to certain people. For some people they can be a huge pain because they are quick growing, too big and hard to get rid of. For others, they are beautiful, decorative and can make an otherwise unsightly shoreline come alive as an exotic ornamental. This plant is so huge, it's incredible. The rate at which they grow is so quick. Their leaves can cover ten feet or more in area and span, and this is of benefit to a living and thriving shoreline. Tiny animals can hide underneath at the shore and escape the sun, predators and other strong weather elements. These leaves also provide a place for the bacteria that benefits the area it's in. These giant-rhubarb plants grow best where there is lots of moisture. A shoreline, bog, or swampy spot is perfect. They will still grow with a lesser source of water and in a drier dirt, but a shoreline is just perfect. If they aren't in a windy place, they can survive some frost and high wind chill. in North American zones, five through 10. Enormous rhubarb plants like lots of sun and some shade. Pretty low or next to no maintenance really. It would be helpful though to keep snails away from them. Snails and slugs aren't good for most plants. They can be divided in the Fall or Spring like most other plants, but it has to be done before they get too huge otherwise it becomes next to impossible. The seeds come from huge flower heads. You could recognize the plant itself by the yellow flowers and spikes. The stems, which are fairly thick and tall support the heads. They are rather thorny with small green and red fruits. The leaves have spikes on them too. 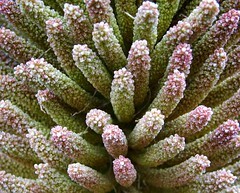 The gunnera-manicata is a wonderful compliment in a decorative way to a specified area, but make sure you have a massive piece of property or space to accommodate. They need to grow to their potential as they are meant to.